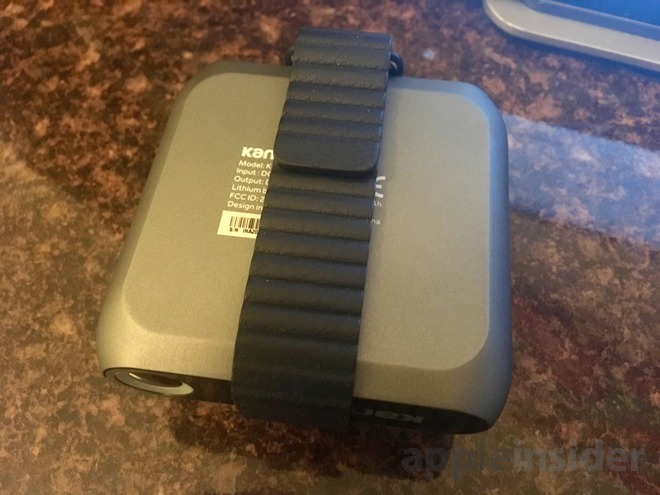 For this review, Kanex provided AppleInsider with a sample GoPower Watch It retails for $99.95, but can be purchased a few dollars cheaper with free shipping from resellers such as Amazon and B&H. In the box you get the all-in-one battery and magnetic attachment to charge your Apple Watch. It also comes with a micro USB cable to juice the battery. The Kanex GoPower Watch is almost square, measuring just over 3 inches in each direction. It's just under an inch thick, though it is a little bit thicker at the top where the magnetic portion juts out. The inclusion of the magnetic charging connector is noteworthy because Kanex's GoPower Watch is one of very few accessories on the market that includes an Apple-approved connector for charging your Apple Watch. Most other accessories on the market, whether they are docks or batteries, require the user to bring their own cable. This not only adds cost, but can also lead to some clunky designs. We appreciate the all-in-one design of the Kanex GoPower Watch, as it's something you can easily toss in a bag and bring on the go without much thought. The outer shell is plastic, but the overall unit is lightweight and its construction seems sturdy enough from our testing. On the front of the unit is a power button surrounded by a blue LED light with four quadrants, utilized to provide the user with an idea of how much battery capacity is left inside. On the back are two ports: A full-size USB input for charging an iPhone or anything else a user might choose, and a micro USB port for recharging the GoPower Watch's own internal battery. We'll have more on those two ports in a bit. 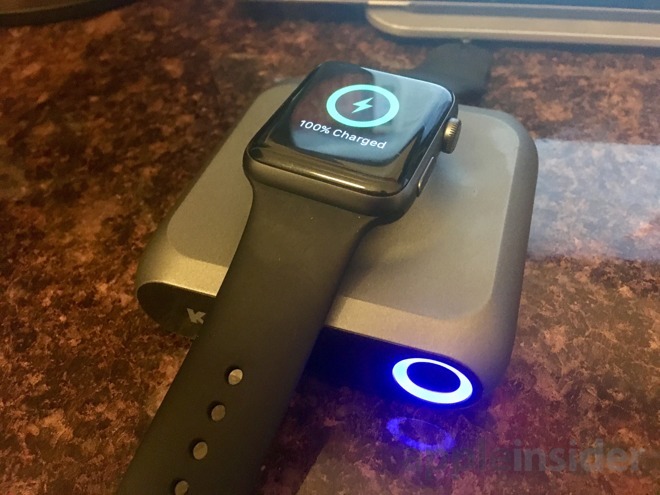 Kanex advertises six full recharges of an Apple Watch, and in our testing that estimate proved accurate. That means that, for most users with typical daily usage of the Apple Watch, the Kanex GoPower will provide you with more than a week's worth of recharge cycles. In our typical daily usage, we rarely run the Apple Watch very far below 50 percent, meaning six full recharges could potentially get us through as many as 12 days without the need to plug in. If you're an Apple Watch wearer who travels a lot, the Kanex GoPower Watch would be an easy way to leave the magnetic charging cable at home for the duration of your trip. Conversely, if you're an active Apple Watch user who can't get through a typical day on a single charge, Kanex's battery provides more than enough juice to get you through at least a few days before the accessory needs to be topped off. It should be noted that the size of the GoPower Watch could prevent you from clasping an Apple Watch band around the unit. Our 42-millimeter Apple Watch Series 2 with the smaller rubber sport band simply would not reach, while a leather loop band could in fact reach. As with Apple's own charging cable, the magnetic connection between the watch and the dock is strong. But some users may want the added security of a clasped band around the battery to ensure it continues to charge when, say, placed in a bag. If you intend to do this, use a larger band. This could also prove problematic with expandable metal bands that remain clasped in a loop. If your band is this style and cannot reach fully around the battery, then you may have to remove the band in order to charge your watch. Thankfully this did not apply to any of the bands we use. 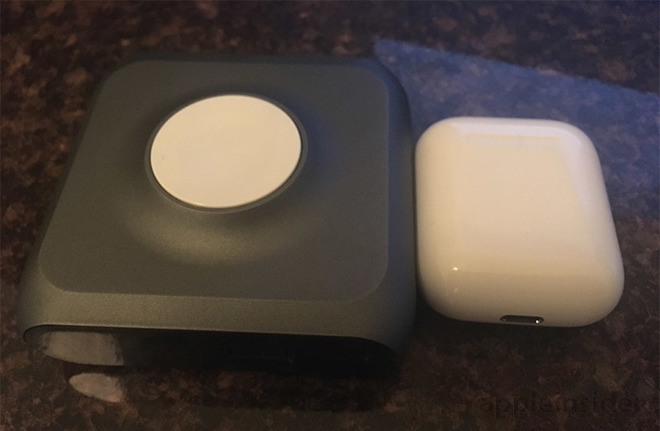 We will also note that the Kanex battery can potentially allow the Apple Watch to work in nightstand mode —the front and back of the unit are flat, allowing it to stand on its side with the magnetic charger facing outward. In our tests, we stood the GoPower Watch on the side with the USB ports, leaving the power button exposed at the top. The base was sturdy enough that we did not feel the battery was liable to tip over from a light touch. 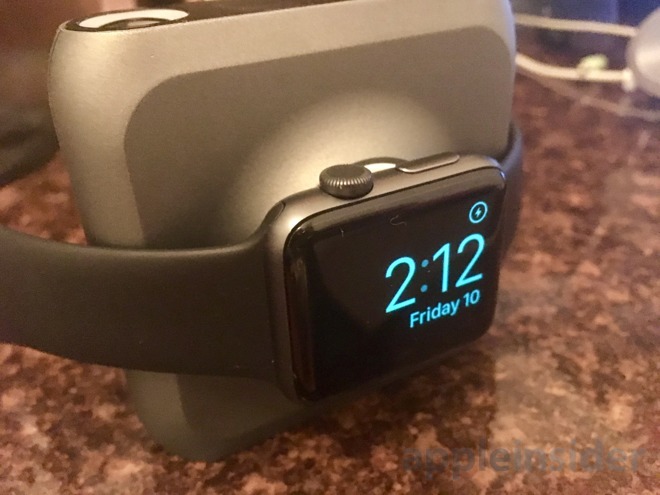 And here again, the magnetic connection was strong enough that the Apple Watch remained securely attached to the GoPower Watch while on its side, allowing nightstand mode to operate perfectly while charging. In a pinch, you could also use the Kanex GoPower Watch to recharge other USB accessories on the go, such as an iPhone, thanks to the full-size USB port out. Unlike other battery banks, however, you shouldn't expect to get multiple charges to your iPhone with this accessory's 4,000mAh capacity battery. Depending on your iPhone, just a single charge could use about three-quarters of the GoPower Watch's capacity. 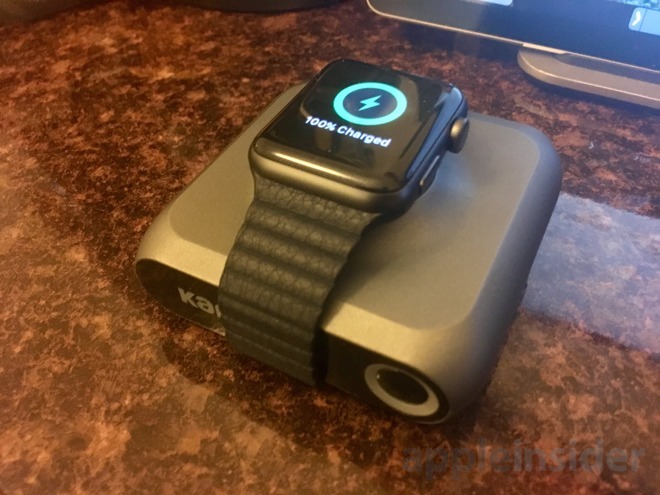 As a result, we think that when used on the go, the Kanex GoPower is best suited for just the Apple Watch. 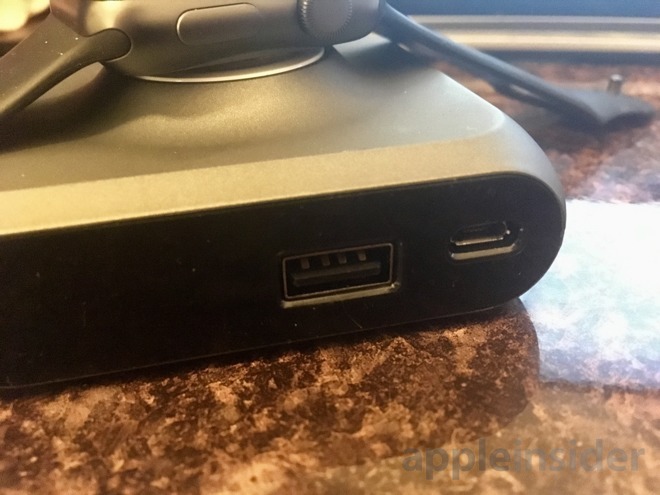 However, the full-size USB-port makes for an excellent power pass-through for your iPhone when the GoPower is connected to microUSB for recharging. In fact, the GoPower can have its own internal battery recharged while also juicing your Apple Watch and iPhone at the same time. In that respect, we could see some users relying on the $100 Kanex accessory as their primary charging accessory, keeping it topped off and plugged in at home and then unplugging with a full battery for use on the go as needed. With that use case in mind, plus the inclusion of an integrated Apple Watch charger, the $100 price tag— while still steep— starts to make sense. Where it falls short, however, is the use of micro USB. Everyone who owns an Apple Watch has an iPhone— Apple's wearable device does not work without one. As a result, everyone who owns an Apple Watch has a Lightning cable. Apple does license the female Lightning port out to accessory makers, most notably with the SteelSeries Nimbus gaming controller for iOS and tvOS. Still, there are very few accessories on the market with an Apple-licensed Lightning port. The Kanex GoPower Watch continues this trend, instead using micro USB for a charge. It's hard to say how much a charger with both a licensed Apple Watch magnetic connector and a licensed Lightning input port would cost. It's likely that the associated fees to Apple are why Kanex stuck with micro USB. But it's definitely a shortcoming of the product for users who are invested heavily into Apple's ecosystem. And, let's face it, if you own both an iPhone and an Apple Watch and are considering a $100 portable charging accessory, you are heavily invested. Apple's own Magnetic Charging Dock for the Apple Watch retails for $79, and it includes both a magnetic charger and a female Lightning port. But it's also made by Apple, and it lacks a battery, making it an unfair comparison. Still, we feel as though the perfect on-the-go portable battery for Apple Watch and iPhone should include a female Lightning port, leaving users with one less cable that they need to carry. Whether the GoPower Watch is worth $100 to you likely depends on your use case. If you are a road warrior and two-a-day workout enthusiast whose Apple Watch struggles to keep up, it's likely a no-brainer. And if you plan to use it as your at-home charger too, the cost might be easier to swallow. Outside of those uses, however, a $100 battery accessory with limited capacity is a tough sell. It would be much cheaper to get a regular battery brick and bring an Apple Watch cable. 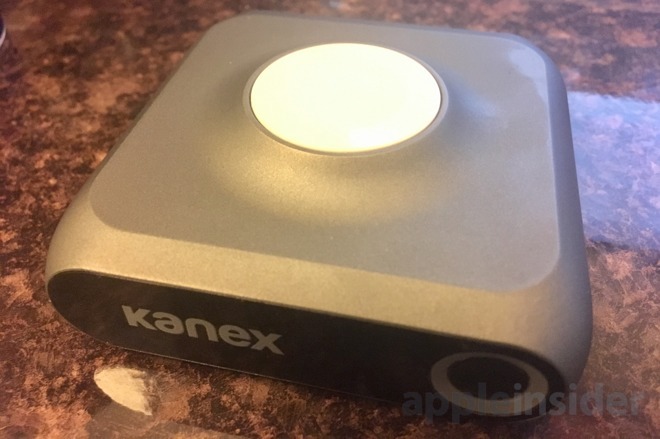 Quibbles with USB and pricing aside, the Kanex GoPower Watch works as advertised, and offers a week-plus of Apple Watch recharges in a single package. It allows you to leave your Apple Watch charging cable on your nightstand at home, and to bring one simple all-in-one solution on the go. And it will even let you charge your iPhone if you need to. The Kanex GoPower Watch sells for $99.95 direct from Kanex. It's also available for $97.99 at Amazon and from B&H.